Each Goodman Doors creation is a masterpiece. We pride ourselves for being a leading door provider in Perth through our Malaga showroom, and our doors are crafted with care and superlative master workmanship. Your choice of a door makes a bold statement of your sense of style and personality. We also pride ourselves on our ever expanding list of homeowners, architects and decorators who have entrusted their projects to us. 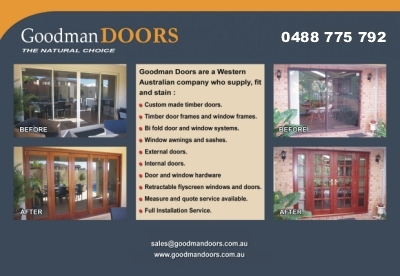 At Goodman Doors, it's the customer above all else. We would love to hear from you - simply give us a call or fill in the form below and one of our specialists will assist you with your enquiry. We would also love to invite you to our showroom to to meet our knowledgeable and courteous staff. SERVING MALAGA, PERTH & BEYOND!